My grandfather came from Poland, traveled from the east coast to Minnesota, then when the lands in western North Dakota became available for homesteading, slid a plank under a rail car and rode to western North Dakota, got off, selected a plot of 160 acres and staked his claim. That particular piece of land is still in the Szudera Family today and is being farmed in a no-till farming practice. 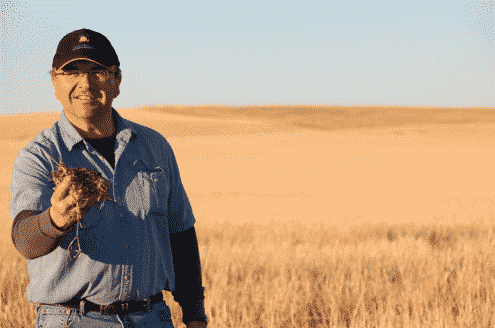 Hello, my name is Steve Szudera, a third-generation farmer from western North Dakota with over 35 years of no-till farming experience building and maintaining soil health. My no-till practices today came as a result of frustrations with wind and water erosion and the soil being depleted of moisture and nutrients of years prior when my father tilled the soil. I learned very quickly that just one simple practice of not disturbing the soil would allow it to rebuild and recover. When I started my journey with no-till cropping systems in farming practices there was very little information about the structure of soil health or even the world beneath our feet that we reference today. The information was there from soil scientists but there was no internet until 1991 to share information about it so it was all done through books. 10 years into a no-till cropping system I began to introduce rotational crops like warm season grasses, cool season broadleaf, dry peas and lentils. Then things really started to get interesting with production crops like wheat, barley and sometimes oats. Yields seem to keep increasing year by year without having to increase the use of commercial fertilizers. What I didn’t realize during this time was that the rotational crops were breaking the disease cycles within the soil from a monoculture cropping system, meaning planting that same plant type on the same soil year after year, the plants were supplying the food to feed the soil food web beneath the surface. We were no longer destroying the home of all the microbial and earthworm activity like we had in years past with tillage practices. I was happy, the crops growing were happy, and world beneath the surface of the soil was happy. Last but not least my banker was happy. Over the years I have become a steward of the soil. In that process I was always intrigued by some of the gardening practices, how hard people work primarily thru tillage practices to make their garden just perfect, purchasing all sorts of amendments and potions to add to the soil. It has always amazed me with wonder, because I have witnessed first-hand how Mother Nature will rebuild and maintain soil and be friendly to even the tenderness of sensitive plants. So, some years back I began to, so to speak, play around with container plants that were either suffering or ready to die. I was able to save most by simply changing the soil environment to a natural source. The next step I took was at raised bed gardening. I wanted to see if I could raise/produce utilizing some of the methods I use to build soil health. I did this in an outdoor gardening setting with the results being amazing. My next step was to see if I could convert an existing tillage garden, to a no-till environment, where it saved water, had less labor than traditional garden, producing a juicier, denser nutrient rich product, all while costing less and saving trips to gardening centers to spend their hard-earned money. Once again, the results were totally amazing; not only did this project get knocked out of the park, but we never pulled one weed all summer, at one time we were away from the project busy with the grain farm for 4 weeks, the automated systems worked flawless. 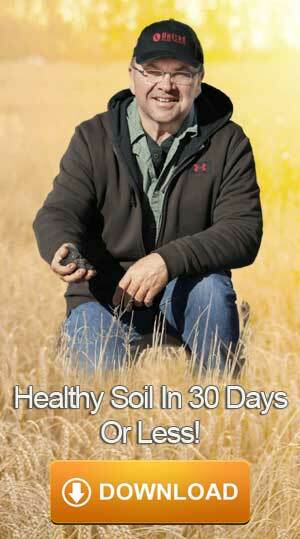 So now my mission is to teach as many people as possible the benefits of building and maintaining nutrient rich soil. I have spent the last 4 years developing and tweaking to make a simple rewarding, enjoyable, less labor and cost saving process, whether it be indoors or outdoors, soil is where it all begins. I look forward to those joining me on this path, “my mission”, to learn about the benefits of growing in a natural organic like soil environment that can be created with a simple natural process just like what does all the work for me in the country in my farm fields.